4, Thursday 11 April: The 39 Articles. At one time, it was expected that all members of the Church would know and be able to recite the Lord’s Prayer, the Ten Commandments and the Apostles’ Creed. These were once the minimum requirement for Confirmation, and to ensure everyone could learn them by rote then were often painted on boards behind the altar or on the east end walls in parish churches. Today, few people may know the Apostles’ Creed by heart, and fewer still may know that while the Apostles’ Creed has its origins in the confession of faith required in the Early Church in Rome for Baptism. How many people know, for example, that we use the Apostles’ Creed at Morning Prayer and Baptism, and it is the Nicene Creed that we use at the Eucharist or Holy Communion? This evening we are looking at the Nicene Creed. Although it is not found in the New Testament, Anglicans have always accepted it as one of the ‘Ecumenical Creeds,’ alongside the Apostles’ Creed and the Athanasian Creed. So, this evening we are looking the Nicene Creed, its origins, how we use it, asking how it differs from the Apostles’ Creed, and looking at its strengths and its weaknesses. These three Creeds have long been accepted as an integral part of Anglicanism. 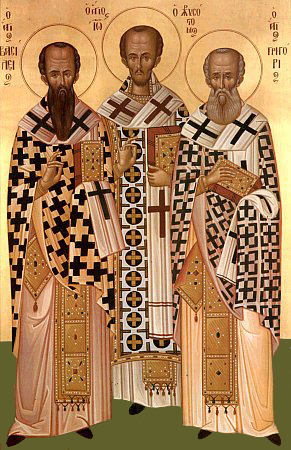 Article 8 of the 39 Articles states: ‘The Three Creeds, Nicene Creed, Athanasius’ Creed, and that which is commonly called the Apostles’ Creed, ought thoroughly to be received and believed: for they may be proved by most certain warrants of holy Scripture’ (The Book of Common Prayer 2004, p 780). In other words, Lancelot Andrewes is saying the tradition of the Church in Anglicanism finds its foundations in the three creeds – the Apostles’ Creed, the Nicene Creed, and the Athanasian Creed – the decisions of the first four General Councils of the Church (Nicaea, 325; Constantinople, 381; Ephesus, 431; and Chalcedon, 451); the first five centuries of the history of the Church, and the corpus of Patristic writings. But what we know and use as the Nicene Creed is a longer formula, used in the Eucharist in both the East and West. This is more accurately known as the ‘Niceno-Contstantinopolitan Creed.’ It is said to have been adapted at the Council of Constantinople in the year 381, although it may have been endorsed rather than drafted at that council, using the baptismal creed then in use in the Byzantine capital. The Vatican wants to return to using the words ‘I believe …’ at the opening of the Creeds. The Nicene Creed as in Holy Communion I in The Book of Common Prayer 2004 opens: ‘I believe …’ (The Book of Common Prayer, p 182). The Apostles’ Creed in Morning Prayer is also expressed as an individual statement of faith: ‘I believe …’ (pp 95, 112). But in the modern versions, the Nicene Creeds opens with the words: ‘We believe …’ (p 205). The Nicene Creed, like the Apostles’ Creed, is best spoken in communion with other Christians, and is only best understood within the context of an act of worship. At first glance it does not appear to be a prayer. Who are they addressed to? Despite their primary place in worship, the Creeds are a mystical statement of our faith, and, of course, we can meditate on them, in the same way as we can meditate on a piece of spiritual writing, prayers from our favourite prayer books, psalms, canticles or readings from Scripture. Like most doctrinal statements, the Nicene Creed was not written in one sitting, nor was it written in a vacuum. This creed was developed, worded, phrased and edited at the Ecumenical Councils of Nicaea (325), Constantinople (381), Ephesus (431) and Chalcedon (451), and the version we have in The Book of Common Prayer (2004) is not the one and only, definitive, ecumenical version. A popular way of expressing this belief for those who agreed with Arius was: ‘There was a time when he [The Son] was not.’ Arius taught that the Father, in the beginning, created (or begot) the Son, who then, with the Father, created the world. For Arius, then, Christ was a created being; his ‘god-ness’ was removed. Alexander, the Patriarch of Alexandria, summoned Arius for questioning, and Arius was subsequently excommunicated by a council of Egyptian bishops. In exile in Nicomedia, Arius wrote in defence of his beliefs. His following and influence grew to the point that the Emperor Constantine called a council of bishops in Nicaea (Νίκαια, present day İznik), where the first draft of what we now call the Nicene Creed was promulgated by a decided majority as a creedal statement of faith – and a firm rejection of Arius’ teaching that Christ was the ‘begotten’ son of an ‘unbegotten’ Father. The principal argument for the full deity of Christ was made by Athanasius, a deacon in Alexandria who later succeeded Alexander as Patriarch of Alexandria. The Creed the bishops assented to in 325 is, for the most part, contained in the Nicene Creed as it appears in the Book of Common Prayer (2004), beginning with ‘We believe in one God …’ and ending immediately after ‘in the Holy Spirit’ (The Book of Common Prayer, p 205). 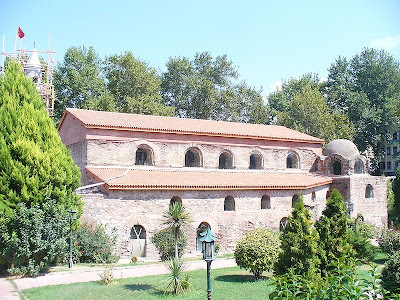 An additional heretical teaching by Macedonius – who was twice Bishop of Constantinople (342-346, 351-360) – denied the divinity of the Holy Spirit. The followers of Macedonius were referred to as pneumatomachians or ‘fighters of the spirit.’ These pneumatomachians also believed that God the Son was a similar essence of substance as the Father, but not the same substance. Yet another group, led by Bishop Apollinarius, who opposed the teaching of Arius, argued that Jesus did not have a human soul and was not fully human. At that council, the bishops reaffirmed and expanded the Nicene Creed of 325 to address further questions about Christ’s divinity and humanity. They added five articles to the Creed concerning the Holy Spirit: the Lord, the giver of life; who proceeds from the Father (see John 15: 26); who is worshiped and glorified with the Father and the Son; and who has spoken through the prophets. Nestorius, who was Patriarch of Constantinople, objected to the popular practice of calling the Virgin Mary the ‘Mother of God’ or Theotokos (‘the Bearer of God’). Nestorius taught that the Virgin Mary gave birth to the man, Jesus Christ, not God the Logos. Nestorianism taught the Logos only dwelt in Christ, whose physical body provided a kind of temple for the Logos. Nestorius promoted the term Christotokos for Mary: the Mother of Christ (‘the Bearer of Christ’). Having summoned Nestorius three times to no avail, the Council condemned his teaching as erroneous and stripped him of his bishopric. The council declared Christ to be both a complete man and complete God, and upheld the Virgin Mary as Theotokos because she gave birth not just to a man. The Council declared the text of the Creed, in its present form of 325 and 381, as complete and forbade any changes. For Anglicans, the 1888 Chicago-Lambeth Quadrilateral does not list the Chalcedonian Creed among the fundamental doctrines for Communion based on scriptures, creeds, sacraments and the historic episcopate. The Chalcedonian Creed does not appear to contain any doctrine concerning the Holy Spirit, nor does it use the word Trinity. This is a single paragraph lifted from a larger document that speaks about the decisions reached at Nicaea in 325 by the ‘318 Fathers’ in attendance and at Constantinople in 381 by the ‘150 Fathers’ in attendance. Pope Leo III forbade the addition of the filioque clause (the words ‘and from the Son’) and ordered the original Nicene Creed to be engraved on silver plates so that his conclusion would not be overturned in the future. The filioque clause was one of the causes that eventually contributed to the Great Schism between East and West in 1054. A resolution of the 1988 Lambeth Conference called for the removal of the phrase ‘and the Son,’ but it still appears in the 2004 Book of Common Prayer. The Father, the One who is Creator, cannot be seen by his human creatures. Yet all authority in heaven and on earth belongs to the Father. Christ, the Word and Son of God, is at the centre of all creation, and through whom all things are made. and was made man (truly human). Earlier this week, we celebrated the Feast of the Annunciation (25 March 2019). What do we mean by saying he ‘was incarnate by the Holy Spirit’? We are just a short time away from Holy Week, three weeks away to Good Friday (19 April 2019), three weeks from recalling the Cross, the death of Christ. The Cross is the place where death and life confront each other, where death gives way to resurrection and eternal life. The highlight of Lent is not Good Friday … it is the Resurrection and Easter Day. There is no reference in the Apostles’ Creed to the Scriptures. What is meant here by the Scriptures? Is the resurrection a story we are to find in the Gospels and the Epistles? Or was it fulfilling the promises of Scripture already received? The Ascended Christ, the Son, is now seated at the right hand of the Father. The figure at the right hand of an emperor or king was his spokesperson, his word. What he said was the word of the king himself. The Apostles’ Creed does not refer to the kingdom without end. This is the Christ who will return again in glory to judge the living and the dead, and to usher in his Kingdom, which will have no end. The Apostles’ Creed makes a very cursory acknowledgement of the Holy Spirit. The action of the Holy Spirit transfigures and transforms, and it is through the Holy Spirit that we are invited to experience new life, especially through the Holy Mysteries of Baptism, Chrismation (Confirmation), Eucharist, and Marriage. The Spirit pointing us towards the Word, revealing to us who Christ is. The Son is begotten of the Father, the Spirit proceeds from the Father. The Orthodox prayer to the Holy Spirit begins: ‘O Heavenly King, Comforter, the Spirit of Truth, who art everywhere present and fillest all things, Treasury of blessings and Giver of Life …’ In the Creed, the Holy Spirit is the Lord, the Giver of Life. This sense of the Spirit as the source of life, everywhere present, filling all things, contributes to one of the distinctive insights and approaches of Orthodox theology, which is intimately bound up with daily life. There is no such thing as theology which is purely intellectual. If theology fails to change me, if it fails to flood me with light, then it is ineffective. The Apostles’ Creed says nothing about baptism or the forgiveness of sins. Every human person is made in God’s image, and as such is made in the image of the Trinity – Father, Son, and Holy Spirit. 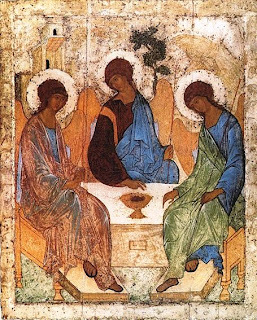 Each person who is baptised actually enters into the life of the Trinity in a unique way, and takes his or her first steps on the path toward divinisation – a path only to be realised in its fullness in the eschaton. The Church is the Communion of Saints, and the promise of the resurrection is for both the living and the dead. How do we give evidence of our vision of the future, the coming of the kingdom and the life of the world to come? ● Some individuals and congregations find the creeds to be irrelevant to daily life, and see little need for them in worship. I am sure some of us are aware of a handful of parishes that can go Sunday-after-Sunday without using the Lord’s Prayer and the Apostles’ Creed, and the Nicene Creed. How do we discover the connections between a profession of faith during Sunday worship, our struggle with issues that are in the Creeds or not in the Creeds, and our daily lives, the decisions, dilemmas and actions we face each day? God as ‘Father’ prompts questions about sexism. God as ‘maker of heaven and earth’ leads to reflections on faith and science. How does this relate to the Dawkins debate? That Christ ‘suffered’ surely relates to the sufferings of his followers too, the sufferings of the Body of Christ. How do we understand the suffering of Christ and the problems surrounding suffering in the world today? Why does God allow suffering? This is the problem we know in theology as theodicy. That the creed is completed with an affirmation of hope – ‘the life everlasting’ – is surely a cause for gratitude and praise. The words ‘and from the Son,’ are a Western addition to the Creed as it was originally agreed on by a Council representing the whole Church, East and West. If we are looking for a statement that can be taken as common ground by all Christians, East and West alike, it clearly cannot include the filioque. On the other hand, Western Christians will be unwilling to have it supposed that they are repudiating the statement that the Spirit proceeds jointly from Father and Son. Some would suggest that we print the Creed with the filioque either in brackets or omitted altogether, but with the understanding that, while assenting to the resulting statement does not commit anyone to belief in the Dual Procession of the Spirit, neither does it commit anyone to disbelief in the Dual Procession. 3, Freedom of conscience: Some fear that any required confession of faith might usurp ‘a tyrannical power over the conscience.’ But once again, what are the limits to the Christian faith beyond which a group or church loses its place within the mainstream Church? Are Non-Subscribing Presbyterians part of the Christian Church? What about Quakers? What about claims by Jehovah’s Witnesses and Mormons to be Christians? Who decides, and what tools or aids help us to decide within an ecumenical context? 4, Creedalism: There are those who argue that ‘Creedalism’ leads to nominal Christianity. They would say that a mental assent to the doctrines of the Creed has often served as a substitute for true conversion and has led to dead orthodoxy. But to even use a term like ‘dead orthodoxy’ demands some definition of orthodoxy. God creates all people, men and women. He creates out of love, for a specific purpose, making our destiny eternal life with him. This destiny is called divinisation, and it means that we are created to experience life within the Trinitarian communion of persons. What exactly this divinisation consists in we do not know, for it is a mystery known only by God. Our participation in the life of the Trinity will not make us sharers in this mystery in the same way each of the Persons in the Godhead shares in it. But God has, in a very real way, entered into the mystery of our humanity, so that we may enter into the mystery that is his communio personarum. Saint Athanasius said: ‘For the Son of God became man so that we might become God.’ By this he did not mean that we will become divine ourselves, but that through his incarnation in Jesus Christ, God has invited us into his life. Bettenson, H, and Maunder, C (eds), Documents of the Christian Church (Oxford, OUP, 3rd ed, 1999). Young, Frances, The Making of the Creeds (London: SCM Press, 1991/2002). Next week (3 April 2019): The Athanasian Creed.